How far in advanced do we need to order a dumpster? 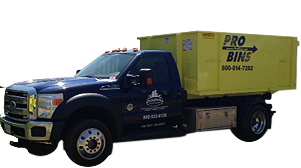 Depending on the dumpster size you are looking for we usually are able to deliver your dumpster the same day or the following morning. Dumpster rentals are easier with ProBins! Our dumpsters are rented out on a business week schedule or for a weekend. A business week would be 5 days. Monday – Friday. The weekend rentals are usually delivered on Friday afternoon and picked up early Monday morning. You also can extend either period for longer up to 30 days. If you are not sure about the size of dumpster you need you should give us a call to determine the size that will best suite your needs. With that being said, there are some jobs that need more than one container. We would be happy to provide an additional container however there will be an additional charge. We go above and beyond to ensure that the container does not damage your driveway. All of our dumpsters are placed on wood so they do not sit directly on your driveway avoiding damaging the driveway. Although, we do our very best to ensure the driveway will not be damaged, if you are looking a disposing of heavy materials it is best that you do not put the dumpster on newly paved driveways. Our trucks can deliver a dumpster almost anywhere. They are equipped with four wheel drive and are lightweight to limit marking your lawns or driveways. Most of our deliveries are usually onto a driveway, yard area or adjacent parking pad. The amount of room that is required for the dumpster varies based on the size you order. However our average dumpster is 12 ft long and 6 feet wide, so it will not take up much more space than a 4-door sedan. Although the dumpster is only one car length, we require ample room in front of where you want the dumpster placed to allow for the truck to drop the container. There are many materials that are prohibited in your container rental. Depending on what you order your dumpster for will change what is allowed in the container. This list is just general information and does not include every possible prohibited material, it is best if you are unsure to ask us. Prohibited Items: EXPLOSIVES, PRESSURIZED CONTAINERS, PAINT, TELEVISIONS, COMPUTER MONITORS, ASBESTOS, LIQUIDS AND HAZARDOUS WASTES. Yard Waste Disposal: Branches, shrubs, leaves and grass clippings are not allowed in the landfills and cannot be mixed with trash loads. A separate dumpster must be used if yard waste disposal is needed. If you have a large amount of recyclable materials such as metal or aluminum a separate container can be provided at a reduced or no cost. Tires can be inserted in the container. There will be an additional charge of $5.00 per tire. Limit 5 per container. They must be on the top of the debris. We accept Brick, Concrete, Dirt, Shingles, Ceramic Tile and Patio stones but they must be separated from other trash and require a special container. Arrangements must be made with us in advance. Do we have to be home for the dumpster to be dropped off? No, but it is helpful to be there to ensure that the container is located in the area you desire. You do not need to be home when the container is picked up. Please note that unless we are notified to extend the time period that the dumpster remains on site it will be picked up at the end of the original rental period. What are the time windows given for delivery? Once a delivery date has been confirmed, we give you a 2-hour window in which the dumpster will be delivered. We will work with you to establish a delivery window that will work for you. Federal laws prohibit the bins from being filled above the wall height. We must also tarp bins to avoid losing material as the dumpster is being transported. No materials are allowed to be above the walls, no exceptions. Can a dumpster be put on the Street? In some communities we can but you should check with your local HOA or Municipal government for guidance. We accept Visa, MasterCard, Debit, or cash. We deliver to all of Carroll County. The Eastern half of Frederick County. Parts of Baltimore County (Reisterstown, Owings Mills. Randallstown, Towson, Timonium, Lutherville, Hunt Valley), Parts of Howard County (Columbia, Ellicott City, Western Howard), Gettysburg, Littlestown and Hanover Pennsylvania. Can you load the dumpsters for us? We offer a dumpster loading and junk removal service. We will inspect the work and provide a written proposal for these services which include the dumpsters and labor.